Crowell School of Business (CSB): Congratulations on winning the 2nd annual Biola Startup Competition, and being selected to be a Praxis Emerging Founder. What is the mission of your new venture, Illuminate International? Jordan (Perkins) Terranova: Our mission is to unite kids around the world through the power of story and education. Through our children’s books, we aim to tell stories from diverse cultures and backgrounds, partnering with world-class animators from studios such as DreamWorks, Nickelodeon, and Disney. Our diverse stories and exceptional artists combine to make a great product that will open eyes to cultures around the world. But it doesn’t stop there, all the profits from these stories fund sustainable education empowerment in villages and schools around the world. We believe in empowering local educators, through curriculum, resources, and training. CSB: Why did you think the Biola Startup Competition would be an essential part of your Biola education? JT: The Biola Startup Competition was influential in shaping my understanding of entrepreneurship in a hands-on and practical way. It gave me the motivation and accountability to pursue my passions, but even more than that, the Biola Startup Competition is a community of like-minded young entrepreneurs willing to push and challenge each other to succeed. The first year, my team and I were actually cut from the competition in the first round, but despite that, I fully believe it was a truly valuable experience that pushed my team and me to refine our idea and continue to work towards our goals. CSB: Thinking back, what was the ‘value add' that the Biola Startup Competition brought you? JT: While all aspects of the startup competition were uniquely valuable, the greatest “value add” for our team was our mentor. Our mentor brought years of experience and a generous spirit that encouraged us throughout the final stage of the competition. Our mentor’s dedication to us, and belief in our idea pushed us to work harder and refine our idea. JT: Well, I married my co-founder, John Terranova! The Biola startup competition, for us, was about more than winning a prize though, it was about working as part of a team to build a company we were really passionate about. We began the competition passionate about our idea, and a couple dedicated to doing big things for God together. The competition strengthened our relationship, strengthened our company, and pushed us into the next stage in our venture. We are so thankful for all that the Biola Startup Competition was for us as emerging entrepreneurs. CSB: How has the Biola Startup Competition and your Praxis Academy experience informed your thoughts relating to integrating theology, culture, and entrepreneurship? Your ‘business as ministry’ perspective? JT: The Biola Startup Competition and Praxis, shaped not only my knowledge on entrepreneurship but also what it means to be an entrepreneur. The character, depth, and dedication that is required. Specifically, as a Christian entrepreneur, I have learned the value of fighting for the "redemptive edge" of entrepreneurship. This means to find ways to reflect God in and through my venture in ways that expand the Gospel message in the world, in ways that impact culture and societies in positive ways. Jordan is an innovator passionate about finding sustainable solutions to big world problems. To address some of the biggest needs she witnessed in Kenya, she and her husband John began a non-profit education and publishing company, Illuminate International. 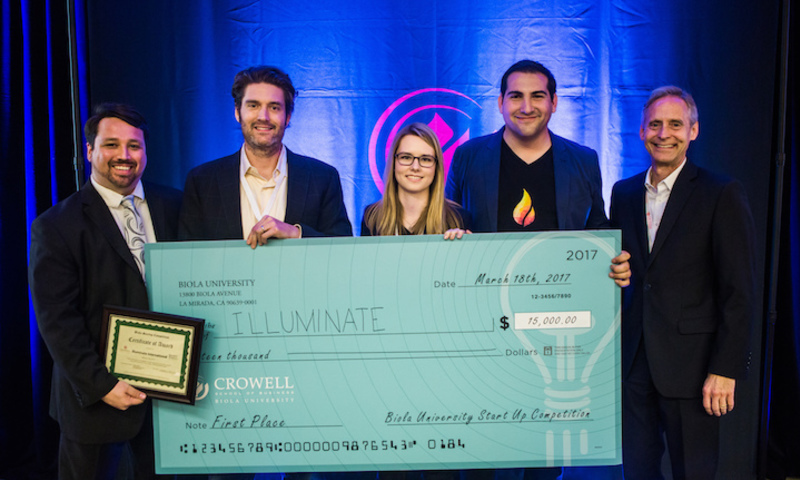 Illuminate recently won the Biola Crowell School of Business Startup Competition. A May 2017 graduate of Biola University’s Crowell School of Business, she is eager to continue working on Illuminate while also balancing a full time job. This past summer, Jordan also had the honor to be a part of the Praxis Emerging Founders program.